We know that your log home or log cabin is an investment, and we will give you the best log home care for the best price! What log home services do we provide? We provide log home restoration, log home repair, log home chinking and caulking, log home improvement, and log home maintenance. If you have any questions or concerns about your log home or log cabin in the Ashland KY area, then please give us a call or you can inquire through our website! We are here to help you, no matter what condition your log home is or what log home care you need! 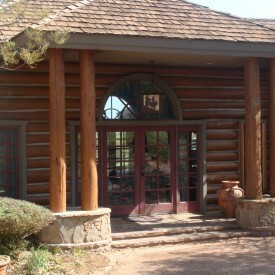 Each log home is unique, and your log home restoration process will be also. For a full restoration, we normally start by stripping the old stain with media blasting (glass, corn cob, sand, or walnut blasting). Next, as an option, we can sand the logs for a nice smooth finish before we treat the logs with a borate solution to clean the logs. Lastly, we seal the home with an energy seal (chinking and caulking) and apply the best stain to make your home look as good as new. 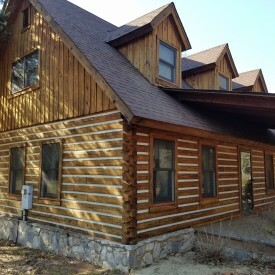 Call us today on how we can transform your log home! If you have logs damaged due to log rot, then there is no need to worry! Our professional crew has the expertise to repair or replace logs that have log rot. If you have logs damaged due to bug or insect holes, don’t fret! Our crew can repair or replace logs damaged by pests. If you have logs damaged due to severe weather, don’t panic! 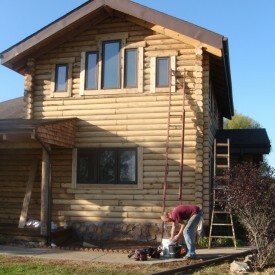 888-LOG-GUYS can fix your log home to bring back its original beauty. 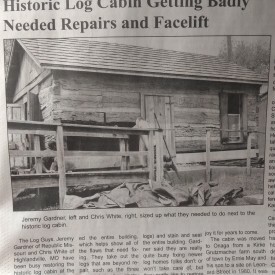 No matter the cause, our company wants to fix your log home back to its excellent condition! Call us today! Have you experienced annoying bugs or insects invading your log home or log cabin? Have you seen water leaking through your walls? Have you felt air drafts around your windows? If you have, then call 888-LOG-GUYS to repair or apply an energy seal in between your logs. A properly sealed log home fills in the gaps in between your logs that are allowing those annoyances into your log home. Call us for an estimate to see what we can do for you! 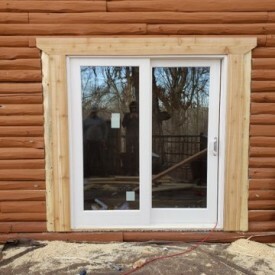 If there is something you would like to add to your log home or log cabin in the Ashland KY area, then contact 888-LOG-GUYS to make it happen. Our crew has the carpentry skills to construct log staircases or build log railings for the interior of your log home. 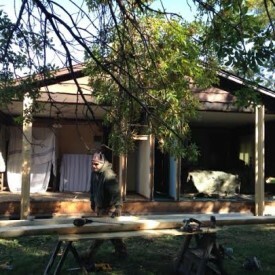 They can also build decks, porches, and patios to extend the exterior of your log home. Please give us a call or ask for an estimate online to see how we can transform your log home from the normal to the extraordinary! If you have a log home or log cabin in the Ashland Kentucky area that is already in great condition, then ask 888-LOG-GUYS to be your log home maintenance company! Once a log home is restored, it will need to be cleaned (washed and re-coated) every 4-5 years to keep the logs healthy and looking new. 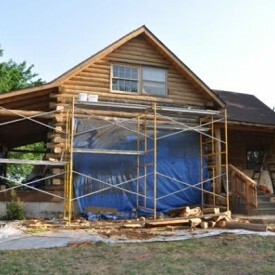 After we fix a log home, it will also need to be maintained. Our staff and crew are dedicated to the proper upkeep of your log home. No matter what, you will always have the support of 888-LOG-GUYS as your log home care specialists.